the beauty of the landscape, the silence, the mild climate, the flavor of a generous land. In order to better discover the charms of the surrounding nature and enjoy the tastes and smells of our table, you can have guided tours, mountain biking and walking, attend cooking classes, tasting and buying fine wines and fine oils, along with all other local products. During their stay, guests can choose between relaxing in the garden or in the panoramic pool or an outdoor activity: biking in the surrounding hills. Who wants to be able to participate in the life of the company taking part in seasonal agricultural activities (grape harvest, olives). We went our family of 8 to the spacious house where we rented all four apartments (the entire house). It's kind of remote but at a really beautiful location in the middle of wine fields. The house is nicely located on a hill which means there's a lot of wind. This makes the hot weather much easier to handle and the climate of the house quite nice. Remember to bring insect repellant though! The pool is great for both adults and kids. The house has a porch and a terrace which are both great places to sit and take in the beautiful surroundings or enjoy a common meal. Rooms are spacious and there was plenty of room for the 8 of us. The pizzaoven is amazing and makes up for the fact that no restaurants are within walking distance. A short drive (10 min or more) away you find restaurants and a bit further is Orvieto which is a really charming medieval town on the top of a hill. Stefano and his wife are great hosts and very eager to help us and make us feel alone. They do not speak a lot of English but enough to communicate! We even one day lost our key to one of the apartments and they came and replaced it without any questions or demanding payment. La casa è situata in ottima posizione (circa 10 minuti) rispetto al centro di Orvieto, all’ingresso dell’autostrada A1 (in circa 1h e 20 minuti si raggiungono interessanti piccoli centri della Toscana) ed ai principali servizi, seppur situata in zona riservata e tranquilla. Dotazione completa, biancheria, stoviglie e attrezzature per barbecue, ivi inclusa legna. Qualche piccolo malfunzionamento della caldaia dei piani superiori ma nulla di grave, camino al piano inferiore ben funzionante, calcio balilla professionale disponibile nel soggiorno, tavolo da Ping pong,disponibilità di piscina per usi estivi, tutto corrispondente alle foto dell’inserzione, struttura assolutamente consigliata. Infine una menzione per Stefano, proprietario molto disponibile e gentile, se decidessimo di tornare in zona sicuramente sarebbe una delle scelte!! We had a wonderful stay at PODERE SANT’ ANTONIO near Orvieto . The house is beautiful, very well equipped and the location is just fabulous. We particularly enjoyed being in the middle of the vineyards, the gorgeous swimming pool and the fabulous barbecue spot. Stefano is so nice and helpful. We hope we come again one day. We have enjoyed a wonderful week in this marvellous house. We were eight people and occupied the full house, so had plenty of room. The location of the house is perfect, in the very quiet and beautiful countryside, in the middel of wine fields, so a very peaceful vacation, as intended. All household articles and kitchenware are available, and the big terrace in front of the kitchen in the "main appartment" is really nice, and offers shade in the daytime, which is needed. This is where we spent most of our time - if we were not at the swimmingpool! With the very nice weather we had, the pool made all the difference, it was so nice to relax there for a few hours in and by the pool. Take care with the wind in the terrace area in the afternoons. It is VERY windy, which is really nice when it is warm, but do not leave things lying around, since it will fly a bit around! Our host, Stefano, is the most friendly and helpful person you can imagine. He assisted us in many matters and offered us some of his own wine, very nice country wine. Also, in mid-week, Stefano came and cleaned the pool. He is a very kind and warm person. Any language problems you may experience will be overcome by his friendlines and helpfulness. Much appreciated by us all. All in all, we can highly recommend this house if you are a group of people who wish to spend a quiet time in the countryside! And do not forget to use the pizza-oven for homemade pizzas, it is really good. 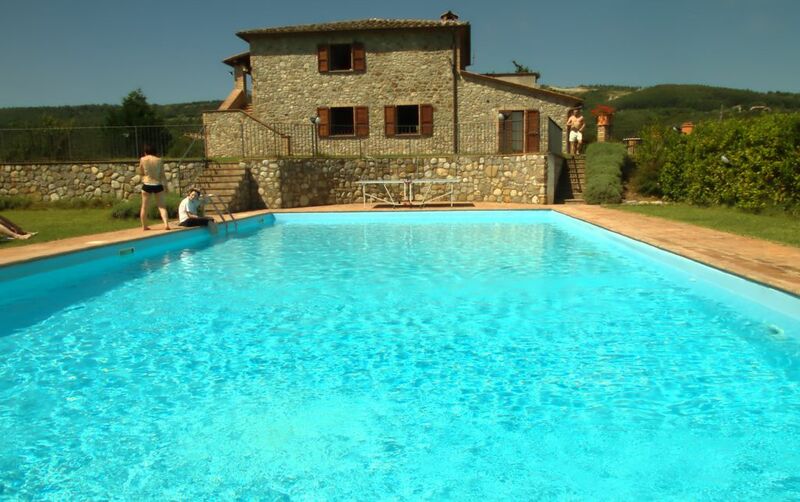 Podere S. Antonio is located in Umbria, only 7 km from the medieval town of Orvieto. Umbria, historic region, famous for small, beautifully preserved medieval villages, offers tranquility and serenity to the spirit. Guests can visit historical and religious routes, because the countries and cities are full of monuments, cathedrals, museums and enjoy fine wines, such as the noble "Est Est Est" Montefiascone, the end of "Orvieto Classico" the famous "Cervaro Cantina Antinori Castello della Sala" and good traditional dishes, prepared with natural products. The strategic location of Podere S. Antonio, a stone's throw from the most important spa towns such as San Casciano dei Bagni Spa (km 28), allows for any type of tour. Furthermore, in a few minutes by car to get in Lazio, Lake Bolsena (20km), Viterbo Terme dei Papi (35Km). Podere S. Antonio is the ideal place to visit the ancient villages, archaeological sites, wineries, craft pottery and wood, to spend a fantastic holiday in perfect harmony with culture, history and nature. Richiesto supplemento per il riscaldamento in base alla stagione dal 1 Novembre al 30 Aprile. Deposito cauzionale di Euro 200. Consegna delle chiavi da parte del Proprietario non presente in locorietario.